Santa receives a letter and starts to wrap presents for the lucky child, but none of the gifts seem quite right. Until, at last, Santa thinks of the perfect present. 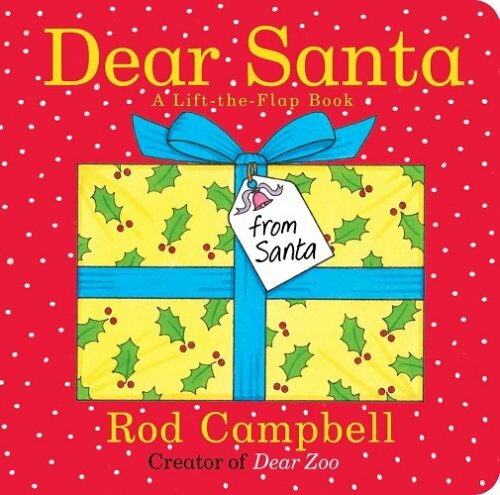 Dear Santa is in a similar vein to Rod Campbell’s best-selling Dear Zoo featuring interactive lift-the-flap illustrations and short repetitive sentences. Kids will have great fun predicting what Santa has wrapped up using the descriptive words as clues (e.g. big, messy, scary), then lifting the flaps to discover what’s inside the package. Dear Santa is loaded with /s/ sounds throughout, making it a brilliant choice for children working on their /s/ sound in words and short phrases. The repetitive sentences also provide a fantastic model for using the conjunction ‘so’ (i.e. “So he wrapped up a….”). For further speech and language targets in Dear Santa, see the list below.